Grace’s closet, circa July 2008. It still looks like this, even though she doesn’t live here anymore. I’ve always loved throwing stuff away and then organizing the remainders. It’s a quality that Kelsey and I share with Mom. My mother is very organized and sensible about her purchases, and she rejects clutter in all forms. We elder sisters have adopted this lifestyle from her. Kelsey in particular keeps an immaculate, minimalist studio apartment that is just zen. I kept all of these letters for years and years, stuffed under my childhood bed. But when we moved to our new house, I threw them all away (saving only letters from precious relatives, particularly my late Great Aunt Lib). This seems harsh and heartless to many, I am sure, but I had to have a hard conversation with myself. What was I saving these letters for? I was never going to go back and read them. Did I think my future offspring would find them interesting? Hardly. Instead, these letters — albeit cute and nostalgia-inducing — were taking up valuable real estate in my home, and were weighing me down, a burden of clutter. I did not need to keep them. I still have the memories of how much joy those letters brought me and how delightful it was to write and receive creative, strange letters as a girl. The simple truth? Clutter affects me emotionally. Although I am not as pristine and spartan about my cleaning regimen as Kelsey (who is? ), a cluttered home — particularly a cluttered kitchen — makes my brain feel disordered. As my eyes scan around our messy kitchen, I begin to feel unhinged, unsettled, uncertain. I have to take immediate action. 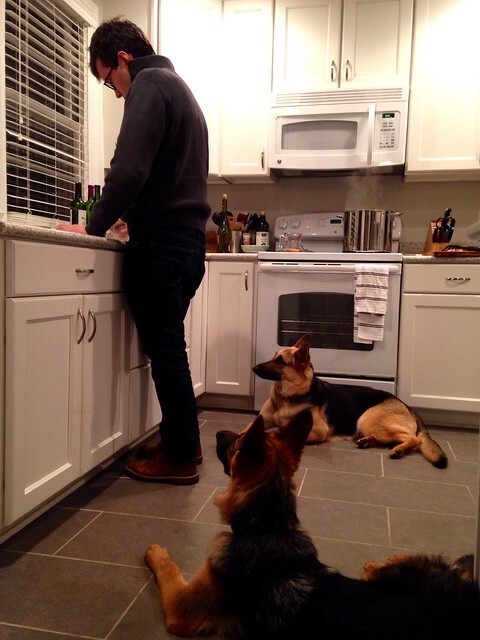 Man and dogs in kitchen. I am not immune to clutter. There are plenty of pockets of clutter in my house. The console table in the dining room has a basket full of unsorted items. My closet is far from pristine. (I haven’t ironed a single thing in months.) And I don’t even attempt to deal with Guion’s various piles around the house; that is his emotional business, not mine. And so I clean and organize my house — not because I feel like I have to, not because it makes me feel superior — but because it keeps me sane. I’m all for the preservation of sanity. Love this. Re: Clutter – I absolutely relate. Re: Living with Kelsey – it’s both a dream and an agony – you’re dorm room is the neatest in the building. Then one day you realize (shoot!) that clutter in the corner, on the table, on my desk, on my dresser, is mine! And you too feel emotionally distressed until it’s put in order. Can Kelsey guest post on keeping an immaculately organized home? Ooh, guest post is a good idea! I’ll ask her. 🙂 And yes, living with Kels is amazing and frustrating, because her standards are VERY HIGH. As with all things. I loved the post. I hate clutter, and it emotionally weighs me down; however, I think I am more closely related to your sister with the exploding closet. I can’t seem to find the balance. Wanted to share this here because it taps right into what I was suggesting the other day. 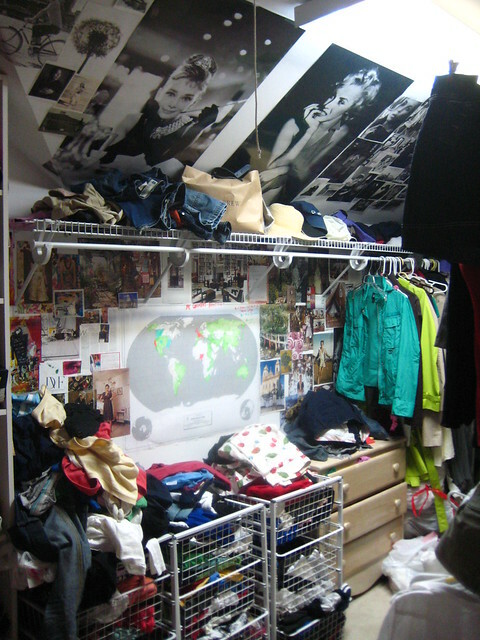 Awesome, personalized post on how to tackle the physical clutter. I am going to show this post to my girlfriend and then take her downstairs to her side of the closet. Hopefully she will adopt your “one in, one out” clothing principle and replace the current “three in, none out” principle that has taken over the closet.